A £5,000 reward is being offered for information about a teenager who has been missing for more than a month. 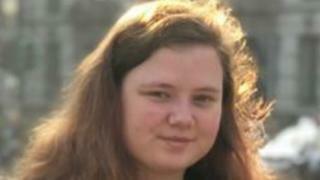 Leah Croucher, 19, disappeared while walking to work in Milton Keynes at about 08:15 GMT on 15 February. Her parents, Claire and John Croucher, said they hoped the money - which was donated anonymously - would encourage people to come forward. In an emotional interview released by Thames Valley Police, the couple said the past month had been "hell". Mrs Croucher said the family were "extremely grateful" to whoever donated the money, and added: "We just hope it prompts somebody to remember and have the courage to come forward. "They need to be brave and pick up the phone and not worry about who they are going to upset. Tell us how to find her, because we've tried everything and we're running out of options." Image caption Her mother said the fact Leah had not used her phone since she went missing was "mind-boggling"
Leah, who has competed internationally in taekwondo, was last seen at the family home in Quantock Crescent, Emerson Valley, at around 22:00 GMT on 14 February. CCTV footage showed her walking down Buzzacott Lane in Furzton the next morning, wearing a distinctive taekwondo hoodie. She has not used her phone or bank cards since. Image caption Police said the hoodie Ms Croucher was wearing was "particularly distinctive and is one of only a very small number in existence"
Mr Croucher - who confirmed that banners to help find Leah would be going up in Milton Keynes this weekend - said he has been living his "worst nightmare". Sobbing, his wife added: "I wake up in the morning and I'm already crying. We just want her to come home." Ch Insp Neil Kentish said the police were "using every tactic available" to find Leah. "I'm absolutely confident that someone has a key piece of information for us that will drive the investigation forward," he added.